The Pacru Club currently just exists in Manchester. An introductory game of Shacru or Azacru will generally take 30-50 minutes, but this can then goes down dramatically (to 15-30 minutes or so for Azacru, 20-30 for Shacru) as you get used to the games. - The first few games of Pacru for a beginner may take over an hour (it depends how much you want to win/learn in your first game): generally with more experienced players Pacru games are more in the region of 40-60 minutes. 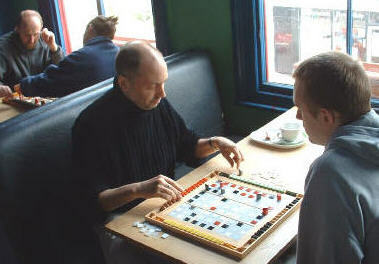 We have plenty of boards and you can play the 2, 3 or 4 player version of Shacru, Azacru or Pacru as you choose. Alongside the championships in November there will be an opportunity for friendly play - get in touch if you want to come to any of these events. Monday 19th January 7.30 onwards. At Fletcher Moss Pub 1 William Street Didsbury. This is 2 minutes from the Wilmslow Road in Didsbury - going down Albert Hill Street (the road with the Post Office on it) - or from School Lane via William Street itself (going off opposite Ciba restaurant / Ogden Street / Milson Rhodes pub). 2 Minutes also from East Didsbury metrolink station. For any more details or questions email info pacru.com and we can put you in touch with the club contacts if you want to talk to them before coming down.